I’ve made two successful trips to Acid Beach in the last week. Both were dangerous and exciting, but extremely rewarding. I need some time to organize the stories, but I thought I should share a related item to a previous posting now. After the climb down into Acid Beach and the more perilous climb out, we visited the so-called Prankster rappel spot south of there that I’ve written about previously. Larry F., was able to find the Amb’s Beach sign he mentioned in his email. It had fallen over and was hidden in the underbrush, but still bristling with mystery. 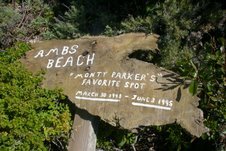 I’d love to know who Monty Parker was, what killed somebody so young, who must have been extremely physically fit to rappel down the cliff to reach “his” beach, and why and who went to the effort to memorialize him in such a touching way? P.S. 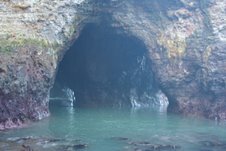 Check out this Y-shaped double arch, or is it a triple, on the south end of the tiny cove between Warm Water Lagoon and Acid Beach. Hands down, this is the best arch on our coast. Next trip I’ll have pictures from inside it. 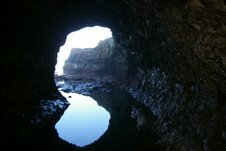 On the north side of this fifty foot wide cove is this other sea arch/tunnel leading to Acid Beach. If you don’t mind getting your feet wet or if there is a minus tide of more then one foot, you can walk all the way through this. I can think of no fifty foot stretch of the California Coast that rivals this tiny, unnamed and almost unreachable cove. This entry was posted in Acid Beach, AMB Beach, John Vonderlin, Monty Parker. Bookmark the permalink.